Acquired: In person, 3/1/14 Talons Season Ticket Party, 5/3/14 Talons vs. Barnstormers. After playing college ball at Texas A&M-Kingsville, Brent joined the AFL in 2008 splitting time on the roster of 3 teams: Georgia, Tampa, and Philadelphia. Still he managed to haul in 69 receptions for 745 yards and 11 touchdowns. 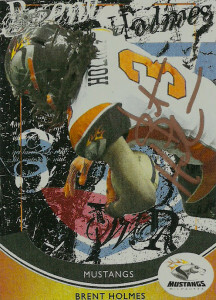 Holmes joined the roster of the Cleveland Gladiators in 2010, where he had his finest season to date, recording 1,299 yards and 22 touchdowns on 110 receptions. In 2011, he’d split time on the roster of the Milwaukee Iron and the Kansas City Command. There he’d bag 70 catches for 772 yards and 10 TDs, before heading over to San Antonio for the 2012 season, tallying another 62 receptions and 4 TDs. Holmes has rejoined the San Antonio Talons in 2014 after spending 2013 with the New Orleans Voodoo. An accomplished return man as well, Brent has returned 178 kicks for 2743 yards and a TD. I was really surprised to see how many players were in attendance to rally support and it really goes to show how much the AFL wants the Talons to succeed. When Brent saw my custom card, he got very excited and hugged the card to his chest. After telling me that the card made his week, he asked me to send him a copy of it since he had never had one before. Brent even got excited about the fact that it was from his time with the Milwaukee Iron. He gleefully signed the card and gave me his email so I could send him a digital copy for himself. I was really happy that my effort could touch his life in such a profound way. Later at the Talons game, Brent had made his way onto IR due to a broken forearm, but he recognized me, and welcomed me with a beaming smile. 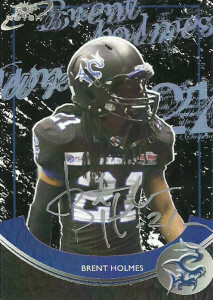 I gave Brent the cards of himself in his San Antonio uniform and had him sign this TNT AFL 14 card for me. He was instrumental in helping me get down to the field after the game so that I could snag a few autographs before the crowd hit. I think a lot of NFL’ers have lost sight of what really makes the league: the fans. It’s not just the paying fans, or the kids, or the money- it’s all the fans they entertain. I wish the NFL would take a page out of the Arena leagues about this, because there’s not much ceiling left for the #1 sport if they aren’t trying to foster the base. Subtle changes were made between the 2011 AFL Starter set and the 2014 Talons release. I removed the team name, and moved the player name up. This was done for bleed and tangent purposes. In addition the player name, number, and position were also colored, as opposed to the flat white. The final thing I did was give a light poster effect to the photo to make it pop a bit from the dark image. I think the 2014 effort is a quiet refinement of the original design, but now that I’ve had time to let it set in, I’d tweak it some more too.